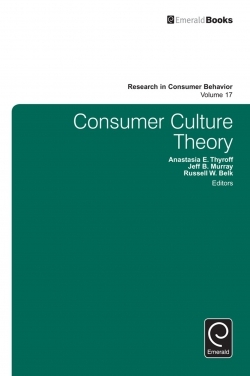 The chapters in this volume have been selected from the best papers presented at the 9th Annual Consumer Culture Theory Conference held at the home of Aalto University in Finland in June 2014. The theme of the conference was Mapping Consumer Culture. The diverse interpretive research and theory represented in this volume provides the reader with intellectually stimulating opportunities to examine the intersections between a variety of theories and methods that represent the cutting edge in consumer research. These studies draw on an array of qualitative methodologies including ethnography, netnography, narrative and visual analysis, phenomenology, and semiotics. The substantive topics represent crucial issues for our times including understanding and navigating cultural diversity and cultural perspectives on co-creating market value. Exploring Fantasy in Consumer Experiences. Narcissism and the Consuming Self: An Exploration of Consumer Identity Projects and Narcissistic Tendencies. Revisiting (not so) Commonplace Ideas about the Body: Topia, Utopia and Heterotopia in the World of Tattooing. Situating Men within Local Terrain: A Sociological Perspective on Consumption Practices. Considering the Human Properties of the Non-Humans: An Analysis of Pragmatogony in Dispossession Stories. Hold the Line! Exploring the Brand Community Coping Process. Consuming Austerity: Visual Representations. Money Talks: Reproducing Deprivation and Empowerment in Poverty through Discursive Practices. Mapping the Real and the False: Globalization and the Brand in Contemporary China. Adapting Ethnography: An Example of Emerging Relationships, Building Trust, and Exploring Complex Consumer Landscapes. Online Reception Analysis: Big Data in Qualitative Marketing Research. Nordic Consumer Culture: Context and Concept. The Branded and Gendered Brazilian Body: Material and Symbolic Constructions in an Overlooked Context. Petals on a Wet, Black Brand: The Place of Poetry in Consumer Culture Theory. Copyright page. Consumer Culture Theory. Introduction. North and South: Special Sessions on Regional Perspectives. Research in Consumer Behavior. Consumer Culture Theory. List of Contributors.